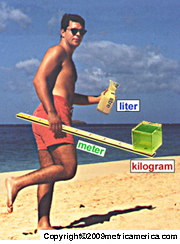 The System of International Measurement called "SI"
is the metric measurement used in America. An international system of measurement evolved that was assisted in it's development as a result of for-sighted American Fathers like Thomas Jefferson who gave us an American dollar with 100 cents and Dr Benjamin Franklin who, along with other devoted attendees of the Academy of Sciences in Paris, contributed significantly to the simple design of measuring in metric dimensions today. 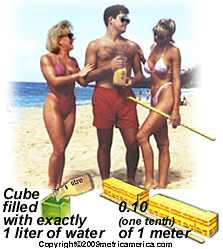 This System of International Units called "SI"
Unlike "inch-pound" measurement, metric measurement is all simply related in 10... just like an American dollar.